Artist’s impression of Civmec’s new shipbuilding facility targeted at defence projects. Up to 1,000 new jobs will be created in Henderson with the construction of a new state-of-the-art shipbuilding facility primarily targeted at Naval Defence projects. Mr. James Fitzgerald (Executive Chairman of Civmec), Hon. Colin Barnett (Premier for Western Australia), Mr. Patrick Tallon (CEO of Civmec) and Mr. Mike Deeks CSC (Managing Director of Forgacs Marine and Defence. 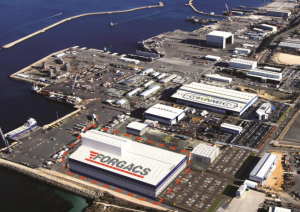 Local construction and engineering company Civmec, through its wholly owned subsidiary Forgacs Marine and Defence, has unveiled plans to build an $80 million world-class naval shipbuilding and sustainment facility next to its current fabrication plant. 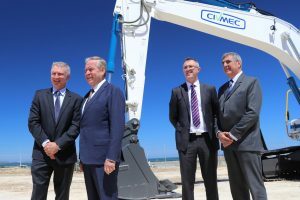 In announcing the 60-metre high facility at a groundbreaking ceremony in Henderson on Friday, Premier Colin Barnett said it will be the biggest of its kind in Australia, providing the Federal Department of Defence and Royal Australian Navy with a significant level of capability. “Civmec already employs 1,500 people nationally and the new facility will deliver capacity to provide additional jobs for up to 1,000 workers, as well as up to 100 additional apprenticeships and graduate positions,” the Premier said. Civmec said the new facility will rival the best shipyards in the world and will be able to house ship construction and on-going maintenance under cover in a conducive and efficient environment close to Fleet Base West – the home of Australia’s submarine force and half of its naval surface fleet. “The Group, which has developed a suite of core competencies in heavy engineering, believes that these in-house capabilities, its dedicated shipbuilding facility and its securing of the strong Forgacs credibility will position the company as a force to be reckoned with for the Commonwealth Governments upgrade and expansion programs,” the company said in a statement. The new facility will be situated on approximately 70,000 square metres of land adjoining the south side of the group’s existing facility at the Australian Marine Complex in Henderson.